DISNEY—Big tires, plus big engines, plus big rocks equals rock crawlers’ dreams. That combination has been very familiar in Disney, on the south end of Grand Lake in Northeast Oklahoma for many years now. Rock crawlers, as they are so named for the ability to traverse difficult terrain consisting of boulders, mud trails, and sheer rock walls, can be Jeeps, offroad pick-ups and now more the popular all-terrain vehicles (ATVs), which are designed to go extreme offroad and to do the impossible. The sport is becoming more popular among those who are looking for the opportunity to test machine against the landscape. Events which bring the Crawlers together are becoming more popular. In the same spirit of a motorcycle rally or a western rodeo, these events provide an opportunity for owners to take to the trails together and build bonds with those who have similar passions. 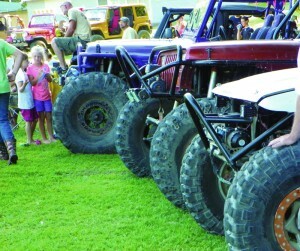 A group of jeeps are lined up for the meet and greet event held Thursday night. Green Country Camp (GCC), aka Green Country Baptist Assembly, hosted such an event in July. CRAWL 4 CHRIST is a nationwide Christian Rock Crawlers jamboree held since 2008. The annual event typically moves from site to site each year. From past locations such as Kentucky and Missouri, the event is designed to bring Christian crawlers together for fellowship and trail conquest. For the past two years however, GCC has had the blessing of hosting the four-day event. The United Christian OffRoaders Association (UCORA), which birthed the event, brought it back to GCC to take advantage of the great terrain offered and the convenience of the family-friendly camp facilities. During the week, families took advantage of the camps’ many recreation opportunities, in addition to the daily trail rides led from GCC. “The location of the camp near the trails makes it very easy for the crawlers to use as a base to leave on excursions,” said John Parker, GCC camp administrator. The Zipline, laser tag, inflatable games, waterslide, and swimming pool were made available to the event goers. David and Judy Austin, members Yukon, Surrey Hills, have attended the event since its inception and serve as major organizers for Crawl 4 Christ. David, who produces an online Christian offroading magazine, C4X4.com, has been instrumental in the ministry of presenting the Gospel to offroaders for many years. While the majority of event goers are Christian, there is always a contingent of the crowd who just shows up for the crawling. 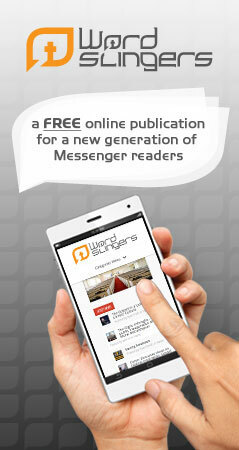 Every year, the event culminates in a presentation of the Gospel and a concert. This year, Todd Craighead, host of “Outdoor Oklahoma,” spoke to the crowd Friday night, giving his testimony and encouraging the gathering towards a relationship with Christ. Saturday, the crawlers were treated to a concert with Amy Hill (amyhillministries.com). Approximately 250 participants with 150 vehicles attended Crawl 4 Christ, some from as far away as Florida and Illinois.